A toddler whose stomach was so bloated she could not eat or drink was found to be carrying her unborn twin. 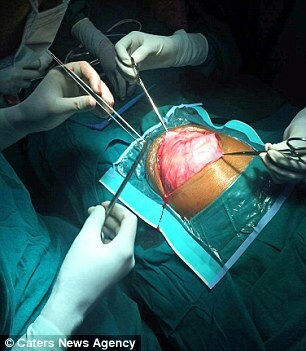 Doctors were astonished to find the 7lb 11oz (3.5kg) mass of bone, flesh and hair inside the girl’s abdomen. The parasite had been feeding off Nisha, after forming an umbilical cord-like structure that leached its twin’s blood supply. She was finally diagnosed with ‘foetus in fetu’, a rare condition with only 200 cases ever reported worldwide. Nisha had been struggling to eat or drink anything and was constantly crying as a result of the parasite growing in her abdomen. The shocking discovery was uncovered after her parents Raju and Sumathi, suspected a tumour and rushed her to hospital. They said the 15-month old had been crying for weeks and could not eat or drink anything. She was taken to Sri Ganapathy Krishna Hospital, a private health centre in Tamil Nadu, southern India. Doctors initially thought she had a huge cyst and were astonished to find the growth in her stomach. The doctors then immediately carried out surgery to remove it.